The presence of minerals and lime in drinking water leads to the formation of lime deposits on some surfaces that interact with drinking water. 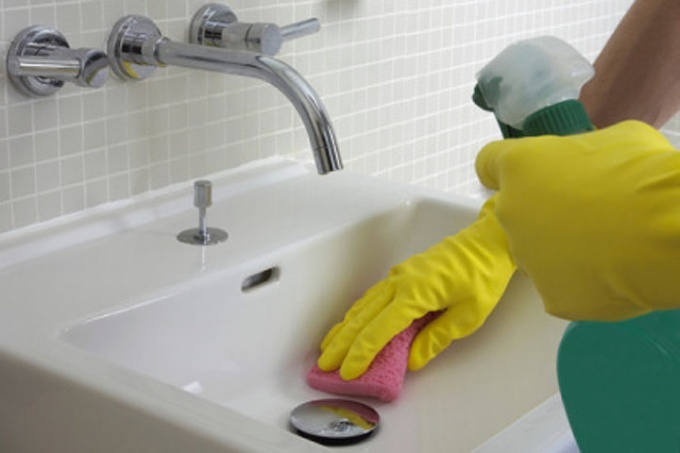 Depending on water hardness, limescale deposits can appear after a few weeks or months. Chemical means for removal of plaque can damage the protective enamel. Get rid of limescale with the help of improvised means. To remove limescale threaded connections with soul, no need to use cleaning products and tools. Just put up a soul in a container of very hot water or under a stream of hot air. The water temperature should be 100 degrees - then you can easily remove limescale manually. This method is suitable for chrome-plated and plastic pipes. For the elimination of lime deposits, you can use a 5% solution of acetic or oxalic acid. This tool is much better and faster will remove plaque than other chemicals. It is important when working with acid caution, avoiding its contact with skin. Clean the surfaces of the acetic acid in small doses. Small limescale that has formed on the surface of plates or glasses, can be cleaned using citric acid. For this it is enough to RUB plaque place a small slice of lemon, after rinse with warm water. To remove limescale from kettle, pour a Cup of vinegar. Fill with water to the maximum level and boil. The scum is gone, there will be only rinse thoroughly under running water. For the removal of old yellow plaque with a bowl pour the vinegar and leave overnight. Will remain in the morning rinse with water and go brush. Your toilet will Shine with extraordinary brightness. Do not forget about precautionary measures, protect your hands with rubber gloves and avoid contact with eyes vinegar and acid.